ISMISS was founded by a group of active pioneer surgeons in the field of minimal invasive and endoscopic spinal surgery. 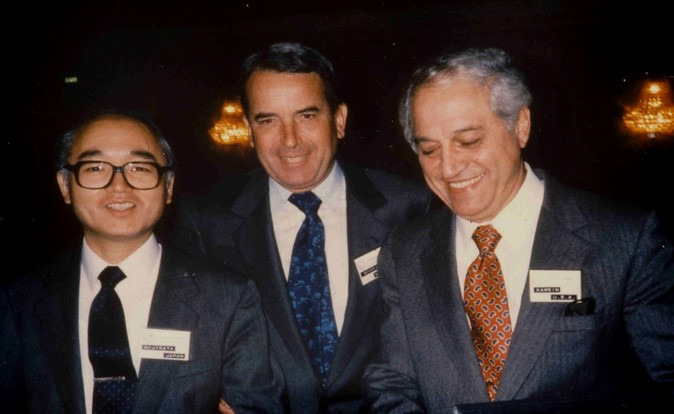 Even before its conception in 1988 in occasion of the Bruxelles meeting, several meetings focussing on this newly evolving field were held in Japan, America and Europe. So a main goal of ISMISS was to coordinate instructional activities and internatinal exchanges. In all three continents respective meetings were inaugurated in different locations. This activites shall shortly be documented in the following sections. Oct 22 1987 : Adam Schreiber, M.D. Jan 28 1988 : Sadahisa Hijikata, M.D. Jul 7 1988 : Wolfgang Rauschning, M.D. Dec 1 1988 : Jan Sheppherd, M.D. Jun 15 1989 : Sadahisa Hijikata, M.D. Nov 30 1989 : Raymond Roy-Camille, M.D. Jun 21 1990 : Parviz Kambin, M.D. Nov 29 1990 : John McCulloch, M.D. Jun 27 1991 : Parviz Kambin, M.D. Nov 28 1991 : Raymond Roy-Camille, M.D. Nov 26 1992 : Manohar Panjabi, M.D. Dec 2 1993 : Henry Sherk, M.D. Dec 1 1994 : Jürgen Krämer, M.D. Jan 25 1996 : Hallet Mathews, M.D. Jan 23 1997 : John Regan, M.D. Jan 22 1998 : David McCord, M.D. Jan 21 1999 : Daniel Rosenthal, M.D. Jan 20 2000 : Hallet Mathews, M.D. Jan 25 2001 : Wolfgang Rauschning, M.D. Jan 24 2002 : Anthony Yeung, M.D. Jan 23 2003 : De Antoni Daniel, M.D. Jan 29 2004 : Lee Sang-ho, M.D. Jan 27 2005 : John Chiu, M.D. Jan 26 2006 : Rudolf Bertagnoli, M.D. Jan 24 2008 : Jean Destandau, M.D. Jan 29 2009 : Andrea Fontanella, M.D. Jan 28 2010 : Munehito Yoshida, M.D. Jan 27 2011 : Gilles Dubois, M.D. Jan 26 2012 : Pil Sun Choi, M.D. Jan 24 2013 : Lester F. Wilson, M.D. Jan 30 2014 : Gun Choi, M.D. With this larger series of 33 courses the annual ISMISS-meetings became a wordwide recognized forum in this field. Having outgrown in recent years to a worldwide rapidely evolving society, in consequence the Board of ISMISS, it its session of Jan 29, 2015, has decided to follow in the future a triennial cycle with annual ISMISS-meeting in Asia, America and Europe. 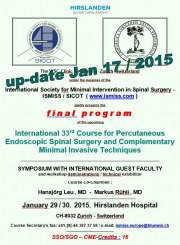 So for 2016 we expect the ISMISS annual meeting in Asia in coordination of Gun Choi, MD, Korea and Yue Zhou, MD, China.